Up Close: How does a school of management manage itself? Here is the latest installment of a new series called Up Close, featuring the day-to-day work of the School and the people who do it. As the leaves shed their colorful splendor, and the daylight hours wane in New England, there comes a time on the HBS campus every fall to pause, celebrate, and remember what truly matters. In keeping with a time-honored tradition a few days before Thanksgiving, the Harvard Business School community gathers to receive a pie from senior leaders at the School. The room where the pies are distributed is filled with warmth and good cheer, hot cocoa, tea, and freshly-baked cookies. It is a familiar sight on Pie Day to see a flood of faculty and staff streaming out with white square boxes holding their sweet gifts. In addition to spreading a little sweetness during this time, our second tradition is one of writing thank you notes, when we take a moment to write an expression of gratitude to a member of the community. This can be thanks to co-workers for filling in, for support they have provided, or for making your day a little bit brighter or easier. Blank cards and collection baskets are available at select locations on campus. The cards are delivered on Pie Day. The pie and thank you card traditions at HBS originated early during the tenure of Dean Kim Clark (1995-2005). Dean Clark was devoted to enhancing the School’s sense community, and during his deanship he tried a few different things to cultivate an esprit d’ecole. There was, for a time, a fall community party -- a Saturday when everyone could come to campus with their families and enjoy games, pony rides, and delicious food. Chris Ramsay from Operations suggested the pie idea one year, and it was so popular that there was no looking back. The pie tradition has endured over the years through three deans and the Great Recession. Where it has been held reflects the evolution of our campus – from the Faculty Club that used to be in Kresge Hall (since replaced by the Chao Center) to the Spangler Center to Crimson Commons to the Chao Center this year. In Dean Nitin Nohria’s words, the pie tradition is “A small way to show my appreciation for everything you do to make HBS such a distinctive and remarkable place." To get ready for the pie extravaganza, twelve Restaurant Associates pastry chefs and colleagues spend five days making pies and hand-decorated fall cookies Todd Mulder, General Manager of Restaurant Associates, shared that some pies are baked in-house, and some are purchased. 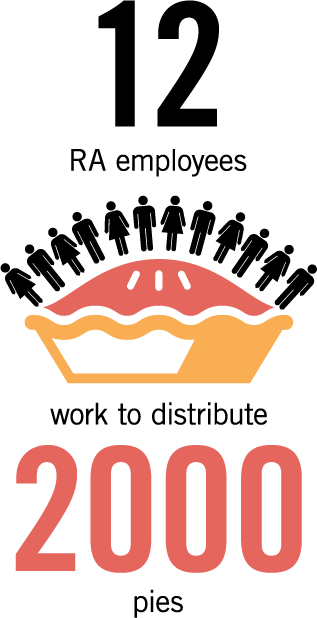 A total of approximately 2,000 pies are distributed every year. All leftover pies are donated to local food pantries. The most popular pie typically tends to be apple, and contrary to popular belief, HBS has never run out of pies, and so everyone is able to take home one special pie home to family and friends. We talked with a few HBS community members about what this tradition means to them. What does it mean for you to work at an institution where you are gifted a pie at Thanksgiving? To me, the pie gift is a wonderful idea. What an honor to receive such a gesture of kindness. It makes me believe that the School truly cares about every one of its staff. I’ve never worked anywhere that baked pies and gave them out to employees. It’s a sweet little tradition. As a new HBS employee, the Thanksgiving pie gift just confirms that I have chosen the right place to spend my days. Not only do I love pie, but this heartfelt, wholesome gift speaks to what a wonderful organization HBS is to be a part of. What do you think about the gratitude notes idea? Do you participate? My favorite part of this event is these notes. When I have a new staff member on my team, and the notes get delivered, it never fails that this is the first time that person has worked in an environment where this type of activity takes place. And then the next day when the notes arrive, everyone just seems a bit aglow when they see the notes in our mailboxes. I make it a point to send five notes of gratitude each year. It reminds me to take time to think about the people I work with. I love receiving them, and I imagine people feel the same when they receive one from me. I think gratitude notes are a great idea. Too often, I think, we express gratitude about someone, but we forget to express our gratitude to that person. The gratitude notes remind us to do that. I love the gratitude notes idea. It’s a great chance to stop and celebrate amazing people across every corner of the School. And it’s always an incredible surprise to receive one. Easy: APPLE. I get there early to make sure I get my pick of flavor. There is nothing better than the classic warm apple pie with cinnamon and vanilla ice cream. At HBS it’s pecan, hands down. Besides being outrageously good, it reminds me of my southern roots. But if any flavor can be chosen, it’s Key lime. My grandmother who lived in Fort Walton Beach, Florida, used to make the most delicious pies that perfected that sweet-and-tart combination. It’s a tie between pumpkin and pecan. It’s often an impossible choice, but I console myself by alternating the flavors I choose. Last year I picked pumpkin, so this year I get to pick pecan. My personal favorite flavor is blueberry pie, but out of the HBS flavors offered, I like pecan pie. Who would you give your pie to if you could? OR Who do you intend to share your pie with this year? I would share my pie with my mom, since my love of pecan pie came from her. I will bring a pumpkin pie to dinner at my parents’ house. Each year, my family brings the Thanksgiving desserts, and the HBS pie is a favorite. It would be wonderful to send it to our troops overseas, or a local shelter/food pantry. I always share the pie with my extended family. We host Thanksgiving dinner for my family, so it’s an easy decision. If I were to give it to someone else, I’d look for a place hosting dinner for the homeless or disadvantaged. I immediately thought of this homeless man I used to see at Park Street station every day when I commuted by train. What is your favorite HBS pie memory from Thanksgivings past? My favorite pie memory is my first year at HBS (2012) and hearing about Pie Day and then the experience of actually being handed a huge pumpkin pie by Dean Nohria himself with a welcoming smile on his face. A lasting impression of a fine tradition. I’ve worked at HBS for almost three-and-a-half years. The first two years I was already traveling home to Atlanta the day the pies were being gifted, so last Thanksgiving was the first year I was able to take part in the tradition. My son had been born in April, and he goes to day care on campus at the Soldiers Field Park Children’s Center. I picked him up and brought him with me to pick up our pie (my favorite is pumpkin) and remember how interested he was in the excited buzz of the room. It was a crisp fall day, and the campus looked so beautiful. I was touched when I approached the table and realized Dean Nohria was handing out pies with other school leadership. I remember feeling so grateful to be a part of this community. It’s a toss-up between Dean Clark’s remembering my name and the year Nancy DellaRocco wore the pie slice hat. I loved when the pies were distributed out of Kresge. The line up the stairs, the Dean at the top, warm cider and special cookies from Restaurant Associates, white November sky outside. Just warms my heart.